On a straight road, especially one with lots of side streets, driveways, parked cars, and pedestrians, any increase in speed above the limit reduces the time you have to scan the environment to identify potential hazards. For our newest drivers this is even more dangerous because every new situation is a puzzle to solve. Once the decision to stop or evade has been made the increased speed you are traveling at increases your stopping distance, and also increases the distance you travel while making any evasive move. This means you have greatly increased your risk of collision. Country roads are different, and can give the illusion of safety. There are fewer entries to the roadway, fewer pedestrians, fewer police, and usually more curves. Going five to ten miles over the limit around a curve could cause the weight of your vehicle and your body inside the car to be pulled to the outside of the turn. As you steer, the vehicles suspension pushes down in the same direction. The more your vehicle leans towards the outside of the road, the more out of control you are. Should something suddenly appear in your line of sight, like a deer (which are plentiful in the country! ), your vehicle can begin to skid if you slam on the brakes. Now for a quick lesson about the advisory speed plate (the name kind of makes me laugh!) - that little yellow sign that temporarily sets a speed five to ten miles per hour below the speed plate. This horribly misnamed sign is actually a temporary speed limit sign for the condition on the sign above it, such as a sharp-blind curve, a blind hillcrest, or a school zone. The sign temporarily adjusts the speed limit. Do you see the huge error a driver could make? He or she could intend to speed around the curve at five to ten over the speed limit, and if the advisory sign is ignored, they could be as high as twenty miles over the posted speed limit! For any state or municipality using an advisory speed plate to make a temporary change to the speed limit is a simple matter of economics. One small square yellow sign is cheaper than two big white speed limit signs – one to lower the limit for the hazard and then another to increase it back to the original limit. The state may also post these signs to take liability off of the state for any mishap that may happen when a driver doesn’t reduce their speed enough. Challenge yourself to find a road in your area that driving straight on will take you from a rural road to a more downtown driving environment. 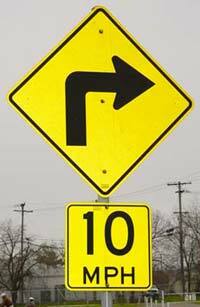 As you see each new speed limit sign ask your new driver to describe what just changed about the roadway. Asses your new driver’s ability to drive a reasonable speed. Find a curvy and hilly roadway where the speed limit is between twenty-five and thirty. Once you turn onto this roadway and your new driver has matched the speed limit tell them you want to challenge them to show you how well you judge a safe speed. Then ask them to drive the rest of the roadway without looking at the speedometer. Tell them to look ahead and choose a speed at which they can stop safely in the distance they can see. Then you must monitor their speedometer as much as you would when driving so you can ask them to check their speed if it gets too fast. (I’ve used this activity for years and the vast majority of my students stay very close to the speed limit on the curviest sections of the road). I hope this article will have a positive impact on you and your new driver! Thank you for reading. 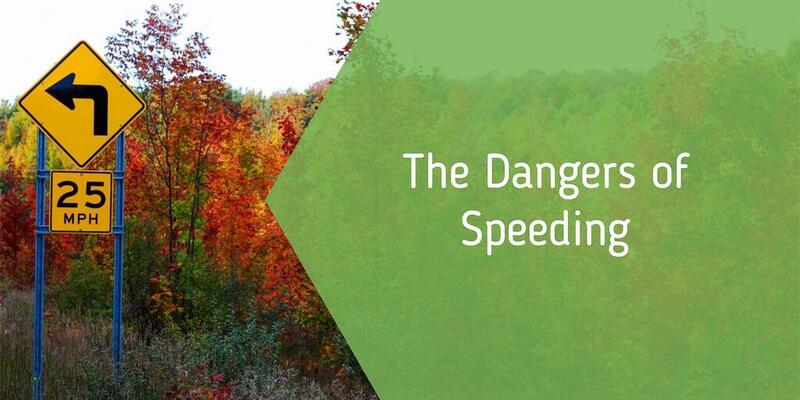 DOES YOUR NEW DRIVER HAVE TROUBLE WITH SPEED LIMITS? GET HELP FROM THE PROFESSIONALS AT THE BEST DRIVING SCHOOL IN CONNECTICUT!